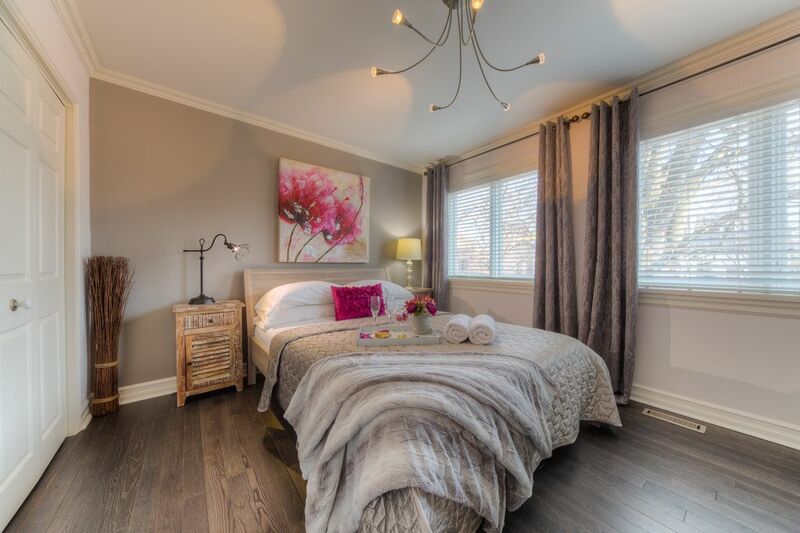 Downtown Toronto - Quiet Luxury Suite (Room with large En-suite bathroom) on the 2nd fl of Grand Victorian Heritage Home. Lock on door suite. Overlooking private Garden. En-suite Luxury Bath with Vintage tub and stand up glass shower. FREE Extreme Wifi & Netflix. Common main entrance. German speaking. Near Univ, Hospitals, Theaters, Restaurants, Pubs. Complimentary Cappuccino, Espresso or Americano. We are located in Toronto's 'Cabbagetown' which is known for having the largest collection of preserved Victorian homes in North America. Built in 1876 this heritage home features original front door with lock, plastered crown moulding and high baseboards etc. Located in the heart of downtown, you are actually only blocks from Toronto's famous Eaton Centre and so many other of Toronto's most recognized landmarks (CN Tower, Distillery District, Rogers Sports Centre, Hockey Hall of Fame, Royal Ontario Museum, AGO). Proximity to Eaton Centre, fine dinning and fancy shops, Distillery District, street festivals, museums, theatres to name a few. This is a preserved historic Grand Victorian home, with all the modern amenities. The moment you enter the hallway you are welcome by original doors, height ceilings, vintage chandeliers and plastered crown mouldings and arches. Lovely character house. Really large and well appointed room. Quiet area. Dana was great and really accommodating when my inbound flight was delayed until after midnight. We had a lovely time in Toronto and were so happy with our room. Dana is a wonderful host and from the moment we stepped into her home we felt right at home. Our room was beautiful, well appointed and the bathroom out of this world. Thank you Dana! We had a wonderful time this past weekend and if we are ever back in Toronto we would certainly stay with you again. We thoroughly enjoyed our time at Dana's beautiful property, as well as her gracious hospitality. The proximity to walk or bike nearly anywhere in the city was great. Would highly recommend to others looking for a quieter and historic neighborhood within Toronto. Dana was very accomadating and helpful with suggestions as to where to eat or what not to miss. Our room was cozy with the most comfortable bed, great shower. Lovely quiet neighborhood, within walking distance of restaurants and Toronto's Distillery District, New Marketplace, and downtown. Dear Mary and Mark: Thank you very much for your kind words. We are happy to know that your short stay here was that great. It is very easy to host guests like you, friendly and respectful. You are welcome back anytime. We love living in this Downtown neighborhood, called Cabbagetown, so close to the best Toronto has to offer. As you have seen it is a very diverse neighborhood where walking under the canopy of the old trees one can forget about the noise of the modern city. You can immerse yourself in the past looking at the old Victorian houses and yet walk to shops and modern or ethnic restaurants. Happy travels! This is a lovely place to stay. Location works for all parts of walking in Toronto. Owner, Dana is Gracious, helpful, kind. Accessible to all parts of Toronto on foot. The accommodations are clean, well-appointed. Just right. I would stay here every time. Dana keeps her house beautifully decorated. Everything is just like in the pictures! Very friendly environment – she tries to help you knowing more about the city, where are the good places to eat and see. I was there for a very short time therefore I took the UBER most of the time because wanted to see too many places in only two days. I am so happy I met this beautiful and kind family.